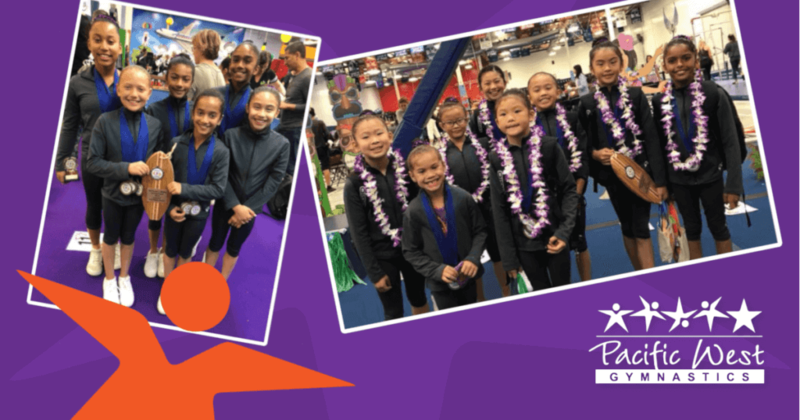 On September 29th our compulsory teams participated in the 2018 Aloha Invitational at Airborne Gymnastics. The Level 3s made their gymnastics debut at this meet. There was a lot of excitement running through each of them as they did their first march in, proudly wearing their beautiful purple leotards. Dylan G. won 1st on Bars with a 9.275 and placed 3rd All-Around. Alainna L. placed 2nd on Beam, Floor and All-Around. She also placed 3rd on Bars. Priseya O. placed 3rd on Vault and Cara W. placed 3rd on Floor. Alainna L., Dylan G., and Cara W. qualified to State Championships at this meet. The Level 4s won 3rd Place Team. This was their second meet of the season and they had 33 hit routines. Three of our gymnasts won 1st place: Emily K. with a 9.275 on Floor, Kaia Y. with a 9.5 on Bars, and Maya T. with a 9.0 on Vault. Jessica N. placed 2nd on Floor. Emily K. qualified to State Championships at the meet. The Level 5s also won 3rd Place Team. This was the second meet of the season and they had 23 hit routines. Alyssa R. won 1st on Beam with a 9.575. Sophia L. won 1st on Vault and Floor with a 9.45 and a 9.225. She also placed 2nd on Bars. Arzou K., Aiyana T., and Maitri K. placed 2nd on Floor. Maitri K. also placed 2nd on Bars and Aiyana T. placed 3rd on Vault and All-Around. Arzou K. qualified to State Championships at this meet.